There are several more chess events held this weekend. 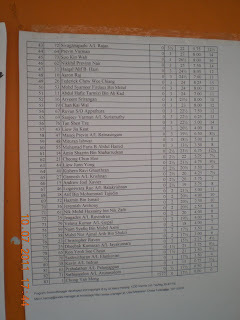 One of them is MAKSAK Chess Tournament that just started today in Ipoh. MAKSAK is just for government servants and agencies. 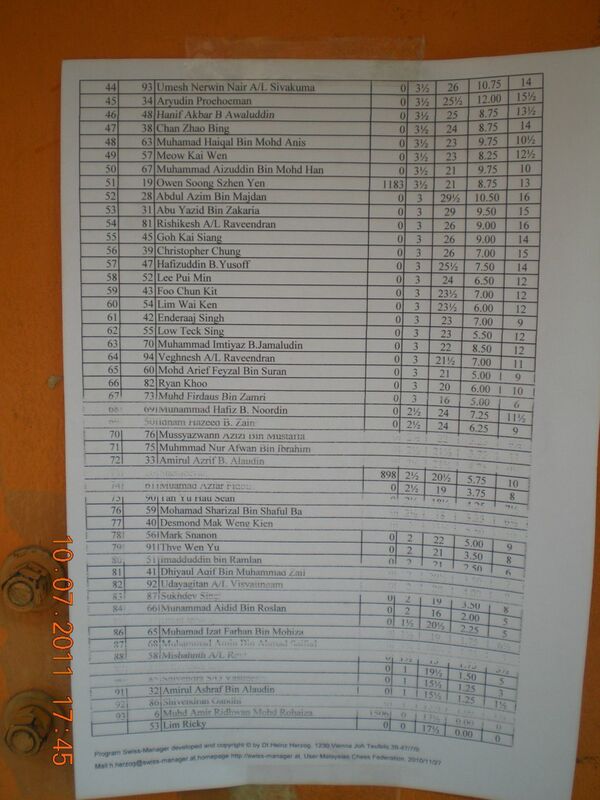 For this year edition held in The Ipoh Heritage Hotel, 13 teams divided into three groups take part in the chess event. WP KL, Johor, Melaka and PDRM (Malaysian Royal Police) in Group A. Four other teams - Terengganu, Perlis, Selangor and ATM, are in Group B. While Group C comprises of Sarawak, Pahang, host Perak, Penjara (Prison Department) and Negeri Sembilan. 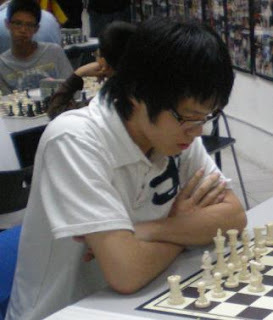 The Selangor MAKSAK team is represented by Law Zhe Kang (above photo), Aimi Nazri Mahat, Salleh Zaki Talib, Mohd Hafez Hilmi Harun, Syed Abdul Rahman Syed Mohamed of 17ChessClub and Azmi Othman. So, how is the Selangor team performance in the group stage? In the first round, Selangor beat Perlis convincingly by 4 - 0 score. Zhe Kang, the highest rated Selangor player (1867), was rested. 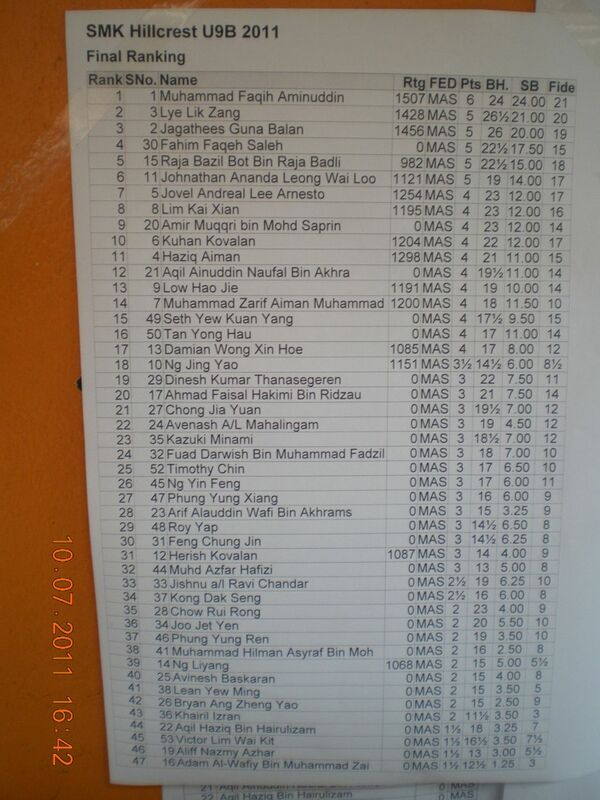 Aimi, Hafez, Syed and Azmi won over their respective opponents. The group's hot favourite team, Terenganu, also won convincingly 4 nil over ATM. In the second round, Selangor had another excellent result when it defeated ATM with 4 - 0 score with similar line up. On the other hand, Terengganu lose one point against Perlis. That means Terengganu 3, Perlis 1. The third round was very important to both Terengganu and Selangor as to determine the champion for Group B. At the first board, Zhe Kang played against Nor Azmi. Fortunately, the former who is a medical doctor GiLoCatur believes managed to win the match. 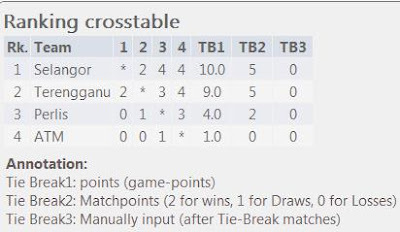 Terengganu won the second board when Hashim Jusoh beat Aimi Nazri. So, it is one point each. Terengganu-born Hafez Hilmi gave Selangor a point when he defeated Professor Rahim Ramli who is also the Terengganu Chess Association (TCA) president. Selangor 2, Terengganu 1. What a result for Selangor, GiLoCatur believes. Can Selangor upsets Terengganu, 2007 and 2008 champion? Syed Abdul Rahman of 17ChessClub is the Selangor fouth board player. His opponent is Indera Shahrin Mokhtar. Indera managed to save Terengganu reputation when he scored the critical point. With that, Selangor drew with Terengganu. Selangor emerged the winner for Group B after scoring 10 game points while Terengganu became second, trailing just one game point. In Group A, WP KL is too strong for the other three teams. It emerged the winner with 9 game points - 3-1 over PDRM, 2.5-1.5 over Johor and 3.5-0.5 over Melaka. PDRM led by Sergeant Ismail Ahmad came up second leading one full point over Johor (6 points). The former team beat the latter 2.5-1.5 in the third round. How about Group C? Which team emerged the top team? Both Sarawak and Pahang shared 11.5 game points. But the the former has better second tie break which is the match point. So, Sarawak came on top followed by Pahang. 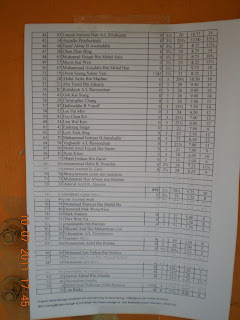 Negeri Sembilan led by Aziz Jaafar is at the third place. 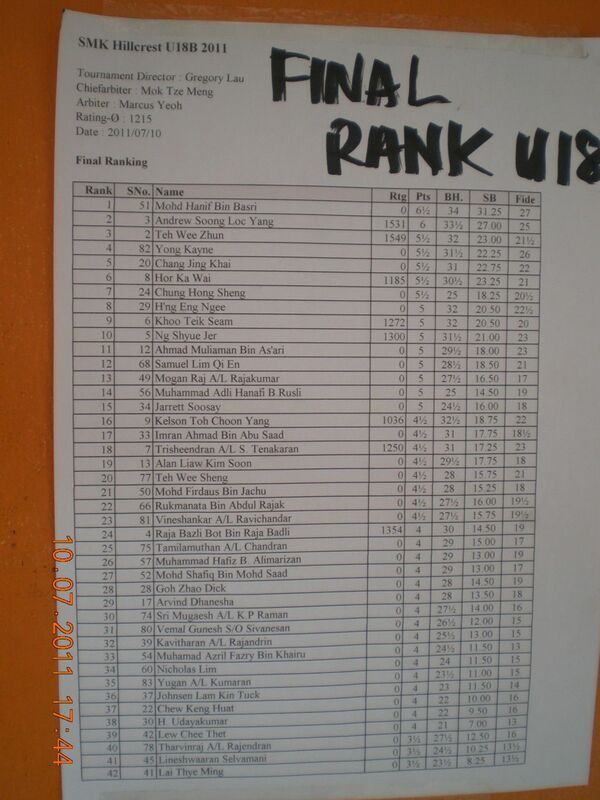 Both Perak, the host, and Penjara is fourth and fifth respectively. The preliminary or group stage is completed then. The top two from both Group A and Group B as well as the top 3 from Group C will play in the Winners pool whereas the other teams will play in the Losers pool. GiLoCatur hopes the Selangor team will play excellently in the Winners pool in the next stage. A Record High Malaysians Competed In Chess Tournaments? 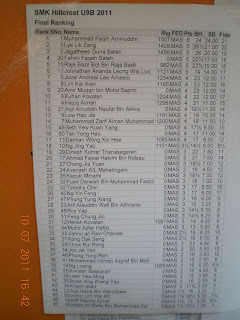 Do you know how many Malaysians were playing chess in tournaments on Sunday, 10th July 2011? Check out the answer below. There were four chess tournaments held in the country on that day at four different places. 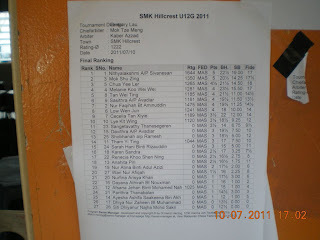 A staggering 470 chess players took part in the SMK Hillcrest Open. They played in nine categories with eight of them were age groups. Ian Udani won the Open category. In Ipoh, Ahmad Fadzil Nayan emerged champion beating 212 other participants in the Tan Sri Lee Loy Seng Grand Final Leg. The tournament was held at The Syuen Hotel. ( Click here for the full results ) In JB, more than 70 chess players participated in three different categories - Open, Under 16 & Under 12, in the 22nd Rakan Muda Tebrau Open. The official winners are as per below. NM Kamalariffin Wahiduddin led his DBKL team to win the MAKSWIP Team chess championship. DBKL has been the champion of such tournament for the past decade. In this year edition, 15 government agencies in Wilayah Persekutuan took part. Since every team team comprises of four players plus one reserve, that means 75 players in total for the tournament. 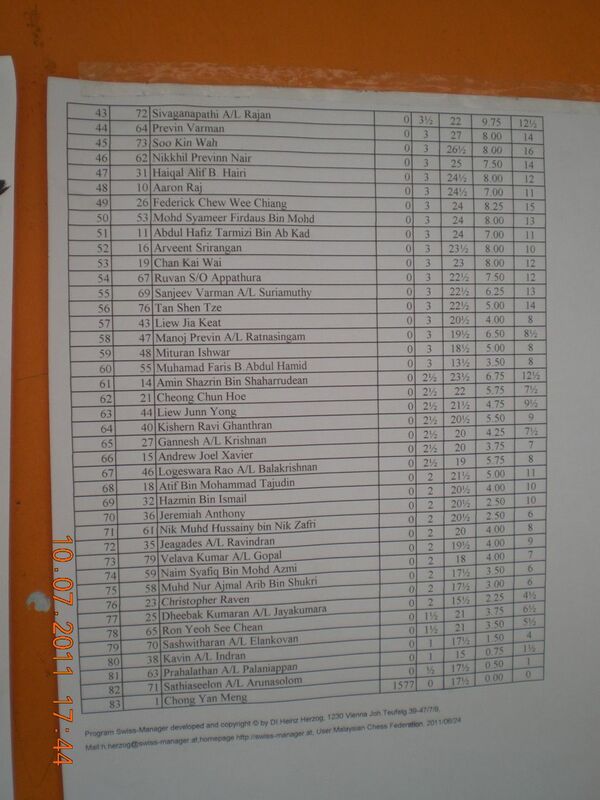 So, more than 850 Malaysians competed in chess tournaments on Sunday, 10th July 2011. Keep it up folks! Second : Leong Mun Wan - 6.0 "
Second : Chan Chee Chai - 6.0 "
second : Danish Hamzah - 6.5 "
Third : Lim Lui Lung - 6.0 "
Who is The Top Most Improved National Ratings for July Release? The latest Malaysian national chess ratings was just made public. It is the July release that will be used for nationally-rated chess tournaments for the period of between July and September 2011. So, how is your latest national ratings? Increase? Drop? No change? Or maybe you just have your new national ratings. Are you among the top 20 most improved players? GiLoCatur would like to congratulate Kughan Ravindran (below picture) for being the most improved player in the new national ratings. He was rated 1263 in the April release. 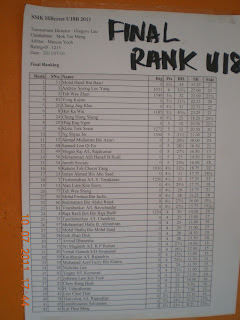 He gained 205 points making his current national ratings to be 1468. He took part in two nationally-rated tournaments namely the 38th Selangor Open and DATCC Warrior. In the former event he managed to win against two 1600+ opponents - in the first and seventh rounds respectively. Such feat contributed the most big increase in his ratings. In the recent 1st SMK Hillcrest Chess Open, Kughan was placed ninth in the Under 15 boys age group. How about the new national ratings of GiLoCatur and the kids? GiLoCatur will write about this another time. 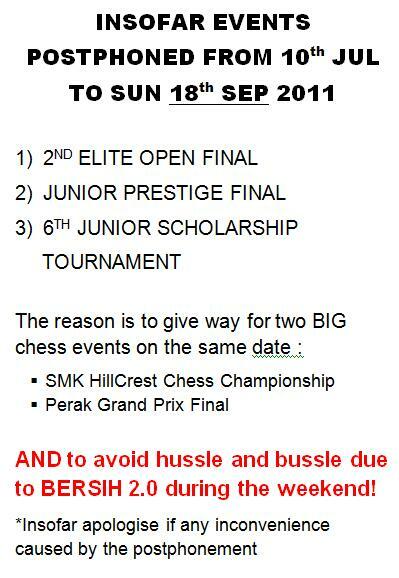 SO, TO ALL THE MALAYSIAN CHESS PLAYERS, KEEP PARTICIPATING IN CHESS TOURNAMENTS ESPECIALLY THE NATIONALLY-RATED ONES. GiLoCatur hopes there will be a number of such events being organized in the next three months for the next national ratings release. This is the nickname in Kampar dialect that GiLoCatur wants to bestow to Eja or Puteri Munajjah Azzahraa (below picture), the youngest daughter of Azhar Mohd Said and his wife Shamsiah. GiLoCatur salutes the dedicated chess couple in sacrificing their money, time and energy to train their four children including Eja to become formidable chess players. It is still a very long way to go but they should be proud with several achievements that their children have had especially by their darling princess. Two days ago, on Wednesday 13th July, the article about Eja and her siblings was published in a Malay daily Sinar Harian. Her latest achievement is getting three golds and two silvers in Girls Under 10 category in the 12th Asean+ Age Group Chess Championship held in Tarakan Island, Indonesia in last June. GiLoCatur became the witness of Eja's achievement in MSSM Chess Championship since 2009 because in that edition GiLoCatur's daughter, Anis Fariha, was her P12 teammates. Anchored by her elder sister, Puteri Rifqah, who played the first board their team won gold for the Under 12 girls team category. Even though, she was just 8 years old, she scored 6.5/7 points. She helped her team became the P12 team champion after winning 6 out of 7 games and scoring 12 match points. 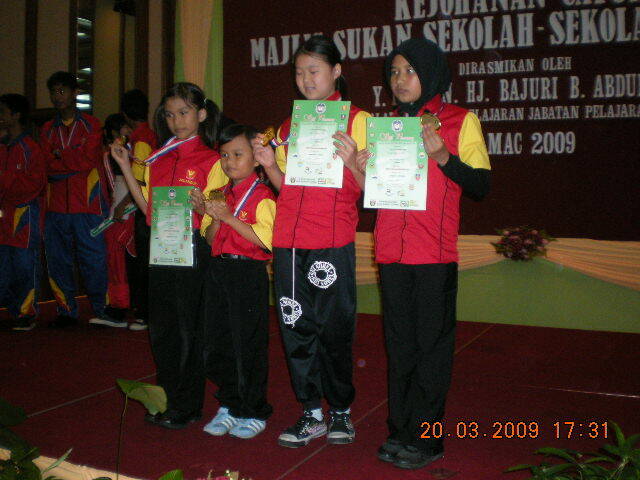 In the 2010 MSSM Chess Championship held in Kangar, Perlis, the small-built young girl had a big responsibility to lead her P12 teammates. Her elder sister played in the individual event. Still having Anis and Sun Xin as well as Nurul Hana, Eja led her team to the silver medal losing only once to the champion, Pulau Pinang. This year, Eja still anchored the Selangor P12 team in the MSSM held in Penang last month. Having two new team mates since both Anis and Sun Xin are over 12 years old already, Eja led her team to a bronze medal. Among her other achievements is she became the first runner up in last year Singapore International Youth Chess Championship in Under 11 Girls category. In that tournament, she managed to win over the top seed and Kazakh chess princess, Zhansaya Abdumalik. 11-year-old Zhansaya who is three times world chess champion recently earned a Women International Master (WIM) title after tied for first place with two other players in the recently concluded Asean+ Age Group Chess Championship in the Girls Under 20 category. GiLoCatur hopes that Eja will get and have the same opportunity as Zhansaya's in sponsorship and grant to advance her chess career and fulfill her dream of becoming the first Malaysian Women Grand Master (WGM). Anyhting Is Possible, Learn It From The Nadeshiko! 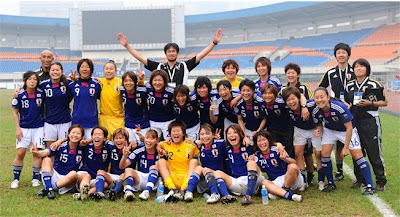 For those who do not follow the ongoing FIFA Women's World Cup being held in Germany, the Japanese women football team or also known as the Nadeshiko has made Asia proud by getting to the final playing against USA this coming weekend. GiLoCatur watched the 2nd semifinal game between Japan and Sweden last night how Japan and was thrilling when the latter came back from 1 goal deficit to defeat Sweden by 3 - 1 score. What GiLoCatur wants to highlight here is anything is possible. Do not be inferior with whatever disadvantages or shortcomings we have like small-built and trailing behind. Hardwork, confidence and believe in yourself are the keys to success. So, to all the Malaysian chess players especially the juniors, follow this example whenever competing in the international chess events. Do not get intimidated by the more superior opponents. Bravo and good luck to the Nadeshiko team in the final. Below are the final ranking for Under 15 and Under 18 boys. Only these two age groups played seven rounds whereas the others played only six rounds. 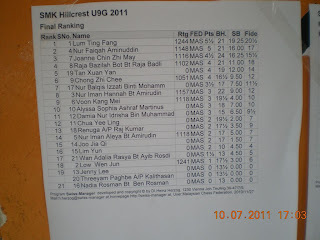 Below are some of the final rankings of the 1st SMK Hillcrest Chess Open tournament. It was quite a long time since GiLoCatur last attended a Malaysian chess rapid chess tournament. It was about three months ago when GiLoCatur and all the kids participated in the UniKL MFI Chess Open. Today, GiLoCatur and family except Anis went to the SMK Hillcrest located in Seri Gombak to participate in its first chess open. Surely, GiLoCatur wanted to be part of the tournament's record of the biggest number of participants. But GiLoCatur changed mind to just concentrate on being a cameraman and observer. GiLoCatur wanted to enjoy being a spectator watching especially the young kids and new chess players. GiLoCatur could be the 471st participant if participated in the Open category. Yes, according to Ms Wong, one of the key members of the organizing crew, the number of participants is a record breaking of 470 players. They played in nine different categories namely Under 9, Under 12, Under 15 and Under 18 both boys and girls plus the Open. GiLoCatur and family were the last ones to arrive at the tournament, 15 minutes before it kicked off. Quickly confirmed the attendance and proceeded to the tournament hall. 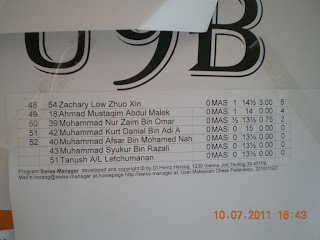 Fortunately, both Fikri and Fahim were playing at the ground floor. Fikri who had to play in the tournament to replace Anis' spot in her absence was the top seed in Under 15 boys category while his younger brother, Fahim, was playing in the Under 9 boys section. The Open category was playing at the first floor. Meanwhile, GiLoCatur is not sure where both Under 15 and Under 18 girls categories were playing. From what GiLoCatur could observe, the arbiters and their assistant crews were divided into smaller groups. 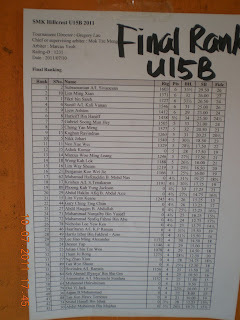 For example, Cikgu Sufi and her husband, Cikgu Zul, were the arbiters for Under 15 and Under 18 boys. At least five other arbiters were assigned other groups. They were assisted by a number of the school's volunteers. The prize giving was also broken up into several smaller groups. In short, the event was smooth sailing. Salute and bravo to the organizing team led by Ms Wong and all the parties involved - arbiters, assistant crews, players and parents who made the chess event successful and memorable. GiLoCatur hopes there will be the second one. The July FIDE ratings was just released several days ago. GiLoCatur is happy because another 2011 Chess Ratings Mission has been achieved. GiLoCatur's daughter, Anis, managed to get her FIDE ratings. 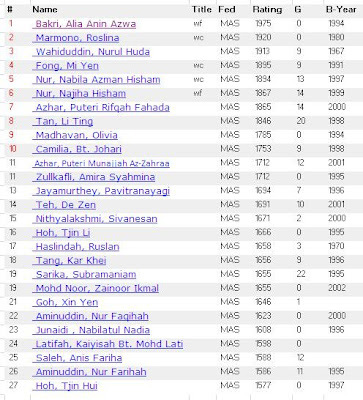 She has joined 26 other Malaysian women chess players in the active (women only) FIDE ratings list as per below. GiLoCatur believes 27 is a very good number and the highest so far since it was only 9 in January 2010 release. Alia who earned her Women Fide Master (WFM) in the last Women Chess Olympiads is the top Malaysian woman chess player with 1975 Elo ratings. Nur Najiha Azman is another Malaysian woman chess player who has a WFM title. For the record, Malaysia does not have both WGM and WIM titled players in its active players list. How many there are the Malaysian women chess players in the inactive list or have not played a single FIDE rated game in the last one year? The answer is 13. 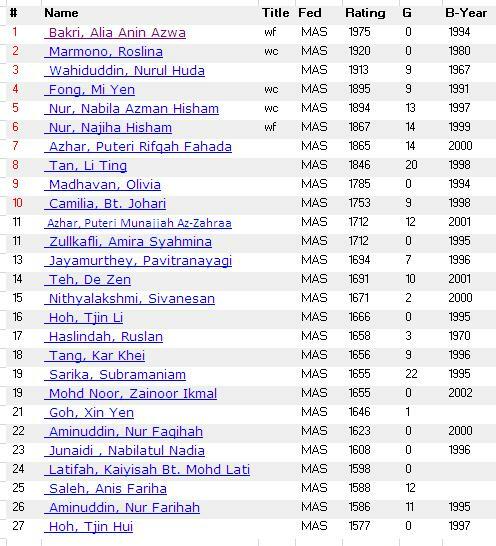 It means, in total Malaysia has 40 women players who have FIDE ratings.The Elo ratings can be improved further since, if you notice, the majority in the above list are still in their teens. BUT it is very important for them to participate in more FIDE-rated chess tournaments. It is amazing to note that Malaysia comes second behind Vietnam in the number of active women players who have FIDE ratings in the ASEAN region. Eighty (80) Vietnamese ladies are listed in the active list where 27 of them are titled players - 3 WGMs, 11 WIMs and 13 WFMs. How about other ASEAN countries especially Philippines and Indonesia? 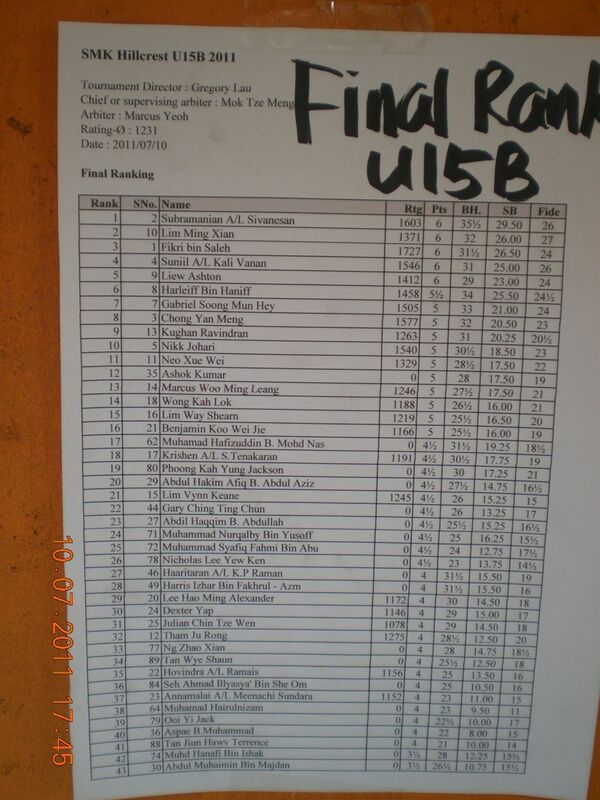 There are 19 Pinoy ladies who have FIDE ratings and active while the number is only 13 in Indonesia. But both countries have more titled players. Indonesia has one WGM and 4 WFMs. Meanwhile, Phillipines has 4 WIMs and 2 WFMs. Singapore has less two players than Indonesia for its active women chess players with FIDE ratings. 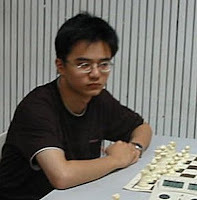 Seven (7) of them are titled players led by Chinese-born IM Li Ruofan who is the top player with 2400+ Elo ratings. The other six are WFMs. 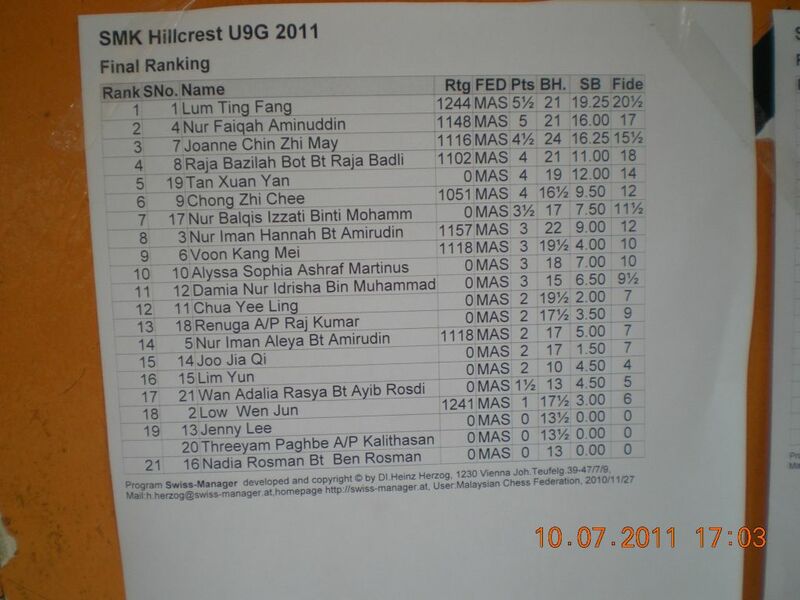 The above statistics shows that the Malaysian women chess has future. The number of the list can be increased. The quality of the Elo ratings can be improved. Attractive prizes and remuneration need to be available for the Malaysian women chess players. More chess tournaments for women or girls like MCF Selection (Women) For Sea Games which appeared in the Commission For Women's Chess (WOM) website here and Susan Polgar Girls' Invitational (SPGI) need to be organized in our beloved country (Maybe Haslindah of BCWM and WNM Khairunnisa of http://setiachess.blogspot.com/ can take the challenge :)- ). More parents need to encourage and motivate their daughters to play chess seriously. MALAYSIA BOLEH? Insofar Final Events Postponed, Folks! TO ALL THE INSOFAR FINALE PARTICIPANTS, THE ORGANIZER HAS AN IMPORTANT ANNOUNCEMENT TO MAKE. AS MOST CHESS ENTHUSIASTS, GILOCATUR DOES NOT LIKE POSTPONEMENT OR CANCELLATION OF CHESS EVENT. BUT IN THIS CASE, GILOCATUR APPROVES AND APPRECIATES IT. IF NOT, GILOCATUR WOULD BE BUSY RUN AROUND BETWEEN SMK HILLCREST AND WILAYAH COMPLEX ON THAT DAY. It is good to know that Malaysia will be represented in the World Junior Open Chess Championship and World Junior Girls 2011 edition that is scheduled from 1st to 16th next month. It will be the 50th edition for the World Junior (Open/Boys) Chess Championship and 29th for the World Junior Girls Chess Championship this year. GiLoCatur is not sure how many times Malaysia took part in the event, but for sure not in the last year event held in Chotowa, Poland. Do you want to know who are the Malaysian juniors to play in the event? Check out the photos below. As of now, 123 Under 20 chess players and 66 young ladies are listed in the tournament for each Open and Girls category. Go here to check the list of the participants. Click here to view the past winners. The link here provides the details and results of the last year edition. GiLoCatur would like to wish All The Best to both Malaysian junior chess players in the tournament. Be prepared well and give your best. Set your reasonable targets. Try to achieve them.